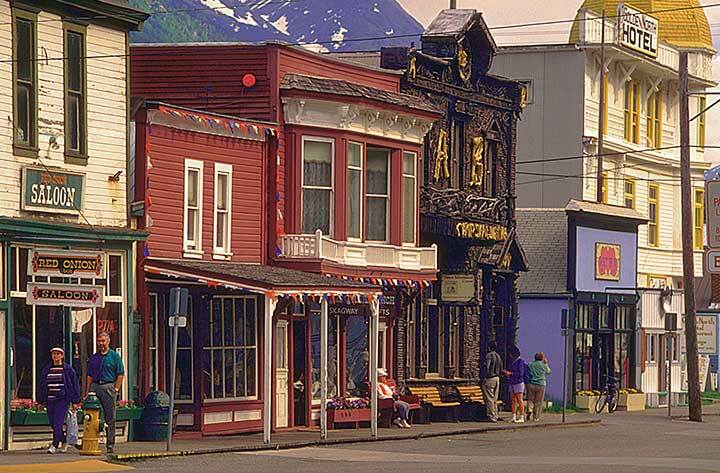 Skagway’s gold rush buildings have been preserved. Presidential hopeful Donald Trump boasts of many things, including his wealth, his popularity and his hand size. Less trumpeted is the fact that his paternal grandfather, a German immigrant named Friedrich Trumpf, kick-started the family dynasty with money he made during the Klondike Gold Rush. The two-storey hotel he ran in Bennett, British Columbia, wasn’t as impressive as the Trump Tower his grandson would erect in New York City eight decades later, but the Bavarian businessman – also known as Fred Trump – did make a handsome profit from his Arctic Hotel’s saloon and bordello. Located on the shores of Lake Bennett, the boom town of Bennett was where stampeders, after making the daunting climb up the White Pass or Chilkoot mountain trails, would pause in their journey to build makeshift rafts, then continue on their way down theYukon River through the treacherous Whitehorse Rapids to the Klondike. But once the railroad from Skagway to Whitehorse was completed, business slowed in Bennett and Trumpf moved his hotel operations to Whitehorse. 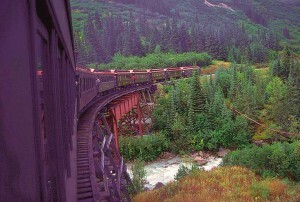 The White Pass & Yukon Route railcars carry cruise passengers to Summit Lake. The historic townsite of Bennett is now featured on an excursion offered by White Pass & Yukon Route’s summertime rail service from Skagway. However, there are few original buildings still standing in Bennett and cruise passengers arriving for a day in Skagway often opt for the shorter trip in vintage railcars to the White Pass summit, leaving themselves plenty of time to stroll the streets of Skagway – one of the best-preserved towns of the gold rush era. Many of Skagway’s original buildings still stand and several of these have been painstakingly restored by the National Park Service. 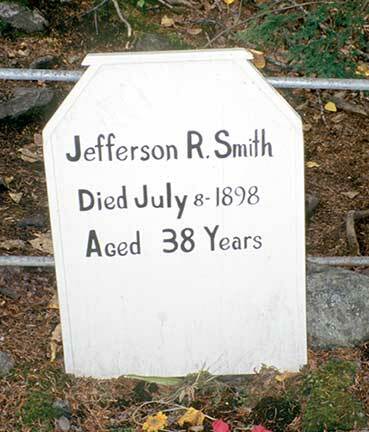 Grave of Soapy Smith at Gold Rush Cemetery in Skagway. 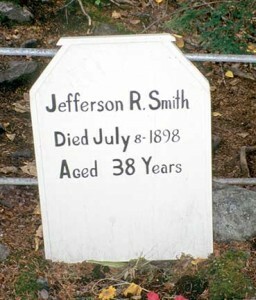 Jefferson Randolph Smith II (Soapy Smith) was born into a Georgia plantation family, which was financially ruined by the American Civil War. Soapy decided to make his mark on the world as a con artist, saloon proprietor, gambling house operator, gangster and crime boss. 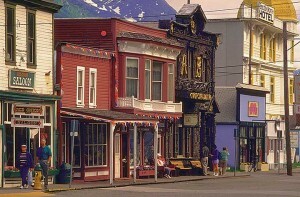 He eventually made his way to Alaska where he met his maker on the streets of Skagway. A cairn near the waterfront marks the spot where Soapy Smith was killed in a shoot-out and his grave is in the town’s Gold Rush Cemetery. Friedrich Trumpf had better luck than Soapy Smith. He left the Yukon with a small fortune in his pocket (about half a million in today’s dollars) and died years later during the Spanish Flu Epidemic. His German widow and their eldest son, Fred, parlayed Friedrich’s New York real estate holdings into the business empire ruled today by Fred’s son, Donald Trump. Anne Vipond is the author of several guidebooks to cruising destinations around the world. She draws on an extensive sailing background to impart her enthusiasm for cruise travel. From her home port of Vancouver, she travels by cruise ship to a wide range of destinations to keep her books current and useful for her cruise readers. Her cruising articles have been published in magazines and newspapers throughout North America and over seas.